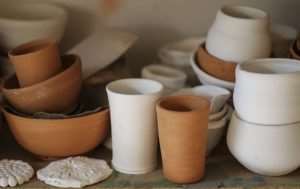 The Ayiwakuo, an association of manufacturers of earthenware bowls, pots and ceramics at Kwahu Nsaba want the Ministry of Trade and Industry to factor their work into the One District One Factory Programme (1D1F). This the group said is to help provide a market for their produce and jobs for the youth. Speaking in an interview at Kwahu Nsaba in the Kwahu West Municipality, Madam Abena Serwaa, the leader of the association said, the gesture could help minimize the health risks that they encounter during the baking of their finish products. Madam Serwaa explained that the situation had rendered most of the aged and some of the youths engaged in the work jobless. She said a lot goes into the production of the ceramics but prices offered by their customers are not encouraging and said, some of the customers offer as low as Gh¢2.00 per an earthenware bowl ‘ayiwa’ and Gh¢3.00 for a polished ceramic. She entreated the Municipal Assembly to provide them with excavators, tricycles and other modern equipment that they could rent at a fee to help them improve upon their production.